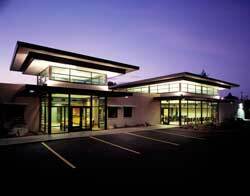 The Inland Northwest AGC is pleased to offer its members access to our meeting facilities free of charge. The AGC Building features several different meeting areas to accommodate everything from classroom training, company-wide meetings and staff social events. The AGC office is open Monday-Friday from 8:00 am - 4:30 pm. However, if your group should require space outside of this timeframe, special accommodations can be made to allow you access to the building 24/7. The Tom Stewart Board Room features an impressive board table that sits 20, with an additional 20 seats along the sides. Additional classroom tables can also be brought into this room if needed. This room can accommodate up to 50 people. The AGC classroom is designed for all types of training and comes fully equipped with a screen, projector, laptop, TV/DVD player and both wired and wireless internet. The classroom can accommodate 30 people. Additionally, the classroom and Board Room can be combined to accommodate groups up to 75 people. If you just need a small meeting space away from the office, our small conference room sits up to 8 people.